While it’s been overshadowed by the “pee tape,” long before Americans had to ponder potential Russian exploitation of President Trump’s sexual fetishes, there was another recording that many believed would do him in politically. The possibly mythical “N-word tape” — Apprentice B-roll in which Trump’s racism is on full display — has reemerged in recent days thanks to Omarosa Manigault Newman. While promoting her book Unhinged, the former White House official claimed that she’s heard the tape and it’s just as damning as Trumpworld feared. But as she portions out juicy allegations to various interviewers, it’s been hard to keep her story straight. On Monday night, several former colleagues said that’s because she’s lying; they accused her of telling them a wildly different tale about the tape immediately after her firing in December. Here’s a guide to all the conflicting allegations about the latest recording plaguing Trump. During the 11-season run of The Apprentice, cameras captured thousands of hours of footage of Donald Trump sitting around a boardroom table, speaking extemporaneously. Rumors swirled during the 2016 campaign that Trump was caught making appalling racist and sexist comments and the tapes became a white whale for a slew of journalists and political operatives. Some found these claims about legal constraints dubious, but no Apprentice outtakes ever emerged publicly. Some sources in the entertainment industry claim they were instructed to stop talking to the media about the tapes, but the rumors persisted. Appearing on an NPR podcast in October 2017, Pruitt said Trump uttered “some really unfathomably despicable words” while they were recording. “I heard it. I watched it, and those things are somewhere in some warehouse,” he said. Asked if the remarks were just about women, Pruitt said, “No, very much a racist issue,” indicating that they included derogatory comments about black and Jewish people. Tom Arnold made similar assertions, claiming shortly after the election that he had obtained outtakes in which Trump “says every bad thing ever, every offensive, racist thing ever. It was him sitting in that chair saying the N-word, saying the C-word, calling his son a retard, just being so mean to his own children.” If Arnold has the goods, he’s keeping it to himself — for now. Viceland’s The Hunt for the Trump Tapes With Tom Arnold premieres next month. Omarosa says that in the fall of 2017, she became newly determined to figure out whether the N-word tape actually existed, as this would be the “last straw” for her. She told then–White House communications director Hope Hicks that chatter about the tape was “heating up,” saying she’d heard from an Apprentice source who claimed to be in possession of the tape, and others who described its contents. “They all told me that President Trump hadn’t just dropped a single N-word bomb. 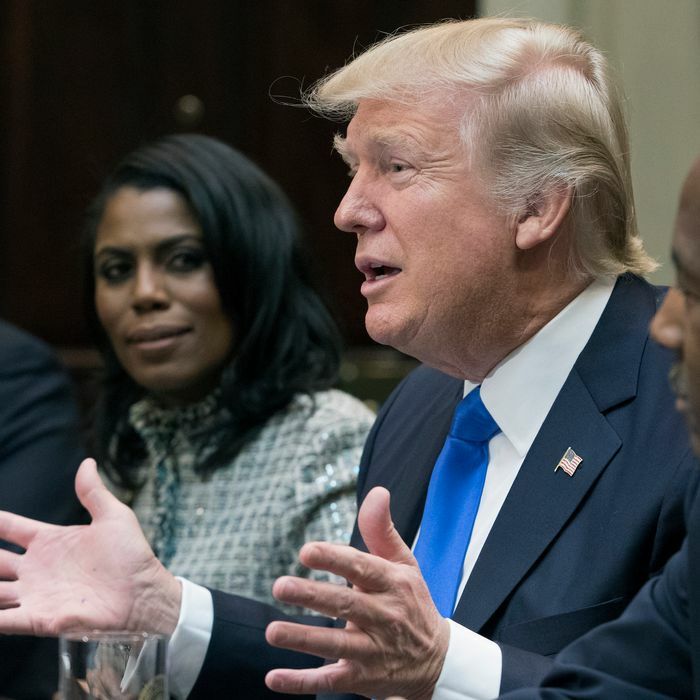 He’d said it multiple times throughout the show’s taping during off-camera outtakes, particularly during the first season of The Apprentice.” Omarosa notes that she and Kwame Jackson were the only African-Americans in that cast. Omarosa says Hicks took a keen interest in her sleuthing, and now she suspects that she told Kelly “that I was this close to getting my hands on the tape.” In passages that sound like something out of a detective novel, she paints her firing and the wild media reports that followed as an effort to discredit her and derail her investigation. On this phone conversation, I was told exactly what Donald Trump said — yes, the N-word and others in a classic Trump-goes-nuclear rant — and when he’d said them. On Sunday’s Meet the Press, Omarosa backtracked, telling Chuck Todd that she heard the recording of Trump using the N-word after the book closed, during a recent trip to Los Angeles. “I heard his voice as clear as you and I are sitting here,” she said. She continued using the alleged tape to tease her book Monday on the Today show, but she bristled when Savannah Guthrie pressed her for more information about the president of the United States using racial slurs. Omarosa offered a few new details, saying the tape is audio-only, and about three minutes long. “He was talking about some African-Americans in the production during the course of The Apprentice, which is unacceptable,” she said. Naturally, Omarosa saved a few more tidbits for her next media appearance. Monday night on Hardball, she told Chris Matthews that Trump uses the N-word in reference to Apprentice contestant Kwame Jackson. She revealed that she heard the recording from a man who used to be part of the show’s production staff, saying the source “took it on themselves” to document Trump’s racism. She said she believes this man may be planning to drop the audio as an “October surprise” ahead of the midterms. While Omarosa now claims that she only heard the tape herself in the last few months, three Trump aides say she told them she’d heard the recording immediately after her firing in December 2017 — and she identified the person who played it for her as former Apprentice contestant Troy McClain. Patton said that Manigault Newman told her last December that McClain played her the audio, which Manigault Newman told her was in Pruitt’s possession. Two other Trump aides received such calls, they confirmed to HuffPost. Those two aides asked to remain anonymous. Patton suggests Omarosa’s depiction of the content was consistent with what she’s said during her media blitz: it’s a three-minute audio recording in which Trump uses the N-word in reference to Kwame Jackson. After the HuffPost story ran, Patton released a lengthy statement claiming that Omarosa called her around 11:30 p.m. on December 12, 2017, saying that she’d just submitted her resignation after hearing the N-word tape, and urging Patton to do the same. Patton says she “notified senior communications officials and a Trump family member” the next morning, only to discover that Omarosa had actually been fired. After attacking Omarosa on Twitter all day, calling her “not smart” and “a lowlife,” Trump insisted on Monday night that the N-word tape definitely doesn’t exist. As proof, he cited a call he claims he received from Mark Burnett, and his own assertion that he doesn’t use such vocabulary. It’s clear that Omarosa hasn’t been able to keep her story straight, and someone is lying about her claims surrounding the N-word tape. But despite the assertions of her enemies in Trumpworld, she’s not the root of the rumor. Many journalists and opposition researchers have been tracking the tape for years, based on tips from a variety of sources. While there may have been a time when the tape would have dashed Trump’s political ambitions, now it’s easy to imagine a racist Trump rant flopping as an “October surprise.” There’s no shortage of examples of Trump’s racism, from accusations that his family’s real estate business discriminated against blacks in the ’60s and ’70s, to his immigration policies, to referring to white supremacists as “very fine people,” to repeatedly disparaging the intelligence of black public figures. Tape of the president using a racial slur would be a scandal, but it’s not going to reveal information voters had no way of guessing.